Oregon and New Jersey are the only two states in the Union that don't allow self-service gas stations statewide. Oregon lawmakers started chipping away at that prohibition two years ago, when they legalized self-service in counties with populations under 40,000. 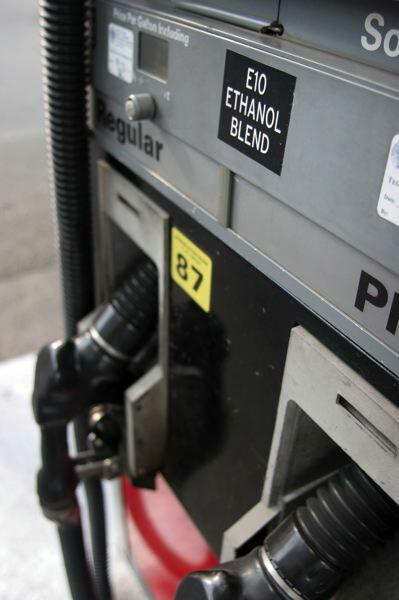 But a bill that received a public hearing Wednesday, March 20, would take that a step further, allowing any gas station in Oregon to designate up to a quarter of its fuel pumps for use by customers who want to fill their own tank. "I've had this idea in my head for several years as a possible way to give everyone what they want," Fahey said. "It would protect full-service gasoline for the people who really strongly want that — and there are a lot of Oregonians that do — and it would give the option for self-service gas to the people who want that. And it would give business-owners the choice." Both Bonham and Fahey drive vehicles that let them take advantage of lesser-known gaps in Oregon's ban on self-service. Bonham's truck runs on diesel, which drivers can pump themselves because it's classified separately from gasoline. Operators of motorcycles and motorized scooters, like Fahey, are allowed to pump their own fuel as well. Bonham and Fahey said they enjoy that convenience, and they want to extend it to motorists regardless of what they drive. "I think all of us have experienced a time when we've pulled up to the gas station and the attendants were very busy," Bonham said. Even with the choice, he would still use full-service sometimes, Bonham said. But he added, "For the times when I felt like I was in a hurry, if there was a pump available, I would love to have that quick access." Fahey and Bonham said they don't want to do away with full service altogether. "I really don't want anybody to lose their work over allowing for self-service," Bonham said. "And I think the majority of people still like full-service gas." "Part of the reason for the 25 percent number is because you still have to have someone who is out, who is dispensing gas," Fahey said. "That would mitigate the potential job losses." But Fahey also noted that many business owners are having trouble hiring. "If we're going to make a change that might have some potential for some small job loss, now would be the time to do it, because the unemployment rate is so low," Fahey said. At the March 20 hearing, state Rep. Rob Nosse, D-Portland, argued against self-service gas. "While some people may not view these jobs as glamorous careers, it's honest, entry-level work where people employed doing this work can build a work ethic and acquire the basic skills needed to succeed in a work environment," Nosse said. Nosse voted to allow self-service in low-population counties in 2017 because he saw it as a safety issue, he said, but he sees HB 3194 differently. "What I really think is that something quirky and charming about our state would be lost with this bill," Nosse said. "Oregon would lose part of its culture, part of what makes this state unique." Rep. Susan McLain, D-Forest Grove, said she agrees with Nosse, but she appreciates that the bill would preserve the full-service option. "Really and truly, there are people who can pump gas and people who can't do it, and there are people who are of the age they shouldn't be doing it," McLain said. "I think it's important for us to be there for everybody where they are at any skill level, even that of pumping gas." State Sen. Brian Boquist, R-Dallas, said he likes the idea of leaving it up to gas station owners as to whether they will allow self-service. Limiting self-service to a quarter of the pumps is "more than an adequate compromise," he argued. Under HB 3194, gas stations wouldn't be able to charge different rates at full- and self-service pumps. They also wouldn't be able to set different business hours for them. "We wouldn't necessarily want to allow a gas station to stay open 24 hours a day for the self-service pumps only," Fahey said. However, Boquist and state Sen. Cliff Bentz, R-Ontario, picked up on Nosse's comments about self-service being a safety measure in sparsely populated areas. "This is not a question of convenience," Bentz said, invoking the image of a motorist low on gas waiting all night in a small town for the gas station to re-open. Making 24-hour self-service available on a wider basis could improve safety throughout Oregon, Boquist suggested. "The fact that you can access fuel at various times of the night also is just as important in the rural portions of the Willamette Valley and elsewhere," Boquist said. "I would just encourage people … to have an open mind on this particular matter."